GOV.UK has a lot of content and more is published every day. Some users can struggle to find what they need when they navigate through all this content. To try and solve this problem, we launched the GOV.UK site-wide taxonomy. This is our way of organising content so it’s easier to find and understand. For this new site-wide taxonomy to work, we had to find a new way for users to navigate it to find what they need. Our answer to this was to create topic pages, for example ‘Education, training and skills’. These pages show content that belongs to every topic, at every level, of the taxonomy. But our user research showed that users do not only think about topic when they are looking for something. They also think about the content type of the content they're searching for. Corporate reports, consultations and guidance are all examples of content types. Because content types are important to users, we had to come up with a way of grouping content that would make sense to users who rely on content types to find what they need. This resulted in a shortlist of content ‘supergroups’, which were organised according to what a user needs to do. For example, completing a transaction with government - like submitting a tax return - finding information published by government or holding government to account. ‘Guidance and regulation’, ‘news and communication’ and ‘research and statistics’ are examples of supergroups that allow us to organise content in this way. We then made decisions around what gets shown on topic pages and in what order, based on the user needs for the content in each supergroup. Things like guidance and transactions appear first because they’re needed by the largest number of users. Things like consultations, corporate reports and news are provided further down, as they’re needed by more specialist users. Topic pages are a work in progress. We’re still measuring how they’re being used and not all topics have been launched. We’ll continue to iterate and improve these pages. We’ll be using analytics and usability testing to find out how users want to navigate through these pages and whether our content prioritisation works. Mia is a designer on GOV.UK. Is there any preliminary performance improvement data with regard to the implementation of the new taxonomy and structuring of gov.uk? Especially interested in how the Education pages are faring since that was the first segment you beta-tested the new taxonomy with. I'm an Associate Product Manager on the team that's currently looking at front end navigation on GOV.UK. We’re reasonably happy with the performance of topic pages. The bounce rate is roughly the same as the GOV.UK average and we’re seeing very low numbers of users doing ABA loops (navigating to content then going straight back to the topic page). We’re now running A/B tests on topic pages and we’ll iterate them based on the results. I like the idea of sorting by content type and function. 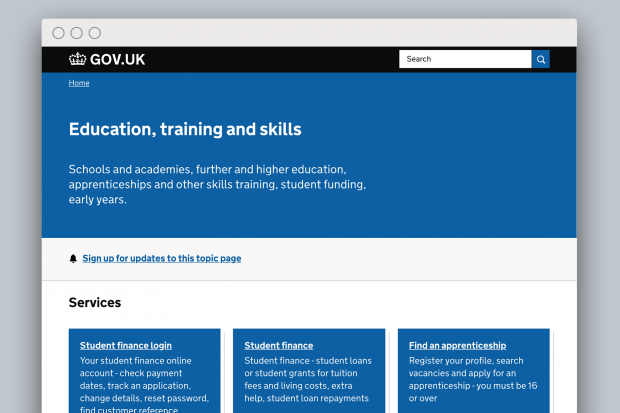 But how do the content & pages listed on this topic page (and its subtopics) relate to the A-Z "Education and Learning" page (gov.uk/browse/education) that you reach through the gov.uk homepage? Would a person going through this topic page be able to access all the same pages available through the browse/education page? Or do they complement each other? Also, I am wondering how one reaches these topic pages from within gov.uk. Topic pages (and the ‘See more...’ finders that they link to) display all content tagged to the sitewide taxonomy, grouped by content type. The Education and learning A-Z is a curated set of ‘mainstream’ content - the content designed to meet the needs of the vast majority of GOV.UK’s users. Yes, a user will find the same mainstream content on topic pages. There are a few gaps in taxonomy tagging, but we’re working to fix this. As it stands, ‘mainstream browse’ and topic pages are two separate structures. Mainstream browse is geared towards the majority of GOV.UK’s users who just need to get in, do something, and get out (for example renew a passport or order a driving licence). Topic pages are currently more for specialist users - those users who need to look at all content types within a subject area. Users can reach topic pages via contextual navigation (the breadcrumbs and sidebar) on non-mainstream content pages. This is really interesting, and a challenge I think a lot of product managers are struggling with. Useful to see how you are addressing it so thanks for sharing. Is there more information anywhere on what comprises the site-wide taxonomy please? I think it'd be easier to see how topics and content 'supergroups' work knowing more about the overall taxonomy. I also notice that on this page, which I get when clicking on 'see more services in this topic' refers to transactions as well as services. Isn't it one or the other? There is indeed more information on the taxonomy - there are two taxonomy blog posts on their way. Watch this space! Transactions are a content type that we categorise under the content supergroup ‘Services’. ‘Mainstream browse’ (/browse/education) and topic pages (/education) are currently two separate structures. Mainstream browse is geared towards the majority of GOV.UK’s users who just need to get in, do something, and get out (for example renew a passport or order a driving licence). Topic pages are currently more for specialist users - those users who need to look at all content types within a subject area. There’s no imminent plan to replace mainstream browse with topic pages, but there’s an understanding that in the longer term we’ll need to look again at how they work together.